Despite the absolute character of Herodotus’ accounts of the destruction of Miletus by the Persians in 494 BC, the city continued to exist, although its population was decimated: a crew of Milesians is reported to have taken part beside the Persians in the naval battle of Mycale in 479 BC. However, they defected and were punished for their treachery when the Persians invaded the city. 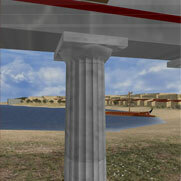 The latter destroyed and looted the sanctuary of Apollo in Didyma and captured Branchides in mainland Asia. After it was freed from the Persians, the city was rebuilt in accordance with the plan of the famous Hippodamus of Miletus and joined the Delian League. The rapid recovery and the excessively high contribution the city had to make (10 talents) show that classical Miletus, without being able to rival its archaic predecessor, remained an important city of Asia Minor. Towards the mid-5th century BC the situation in Miletus was particularly tense because of social and political conflicts. There is little information about the precise conditions of the period because the chronology of the important epigraphic and literary sources of the time is quite difficult. An early dispute (dating from between 470 and 440 BC) seems to have divided the oligarchic side into pro-Athenians and pro-Medians. The latter were exiled and a relative resolution provided rewards for those who would contribute towards their killing. In the mid-5th century BC the Athenians intervened in a conflict between the oligarchs and the democrats and, strangely enough, supported the former side. An inscription of 450/449 BC reports the measures Athens took when it intervened in the affairs of Miletus, including the guard posted in the city. The oligarchs rebelled and massacred the democrats. Athens must have intervened again, as in the decade of 430 BC at the latest the regime in Miletus was democracy, according to the Athenian standards. In 441 BC Miletus and Samos fought for the influence on the territories of Priene. The Samians won but the Milesians caused the intervention of Athens, which favoured them and established democracy in Samos. It is presumed that democracy had already been established in Miletus at the time. In 425/424 BC a force of Milesian soldiers took part in Athenian operations against Corinth. The following year the city gave Athens the substantial number of 2,000 hoplites. Nothing is known about the number of the Milesian allies that participated in the unfortunate Sicilian expedition of Athens. Miletus revolted against the Athenians in 412 BC after the intervention of Alcibiades. 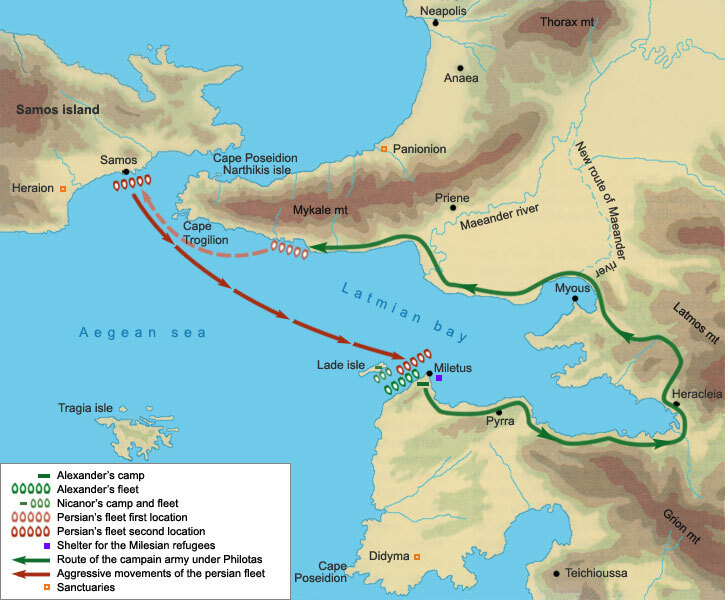 The Milesians denied the Athenians access to the harbour and made them sail to Lade. Later on, they successfully repelled the attack of the Athenians and their Argive allies. However, they maintained democracy, while there were some disputes with the Spartan Lichas, who tried to persuade the Milesians to obey the satrap of Lydia Tissaphernes. For the rest of the war Miletus was the place where the representatives of the Persian king flocked in order to reconcile with the Milesians. In 412/411 BC the Milesians reacted to the presence of a Persian stronghold in their territory and destroyed it. The Spartan general Lichas vainly tried to make them change their mind. They turned against him and, finally, when he became ill and died, refused to bury him in their city. Despite the problems, Miletus remained a military base for Spartan operations. In 409 BC a Milesian force that tried to avert the Athenians from occupying Pygela (near Kuşadasi) was almost completely exterminated. Finally, in 405 BC the satrap of Phrygia Pharnabazus or the Spartan admiral Lysander supported a bloody coup that imposed oligarchy again. After 404 BC Miletus came again under the Persian control. When Cyrus the Younger rebelled, Miletus was the only city that did not join him thanks to Tissaphernes, who had executed or exiled all the supporters of the king’s brother and rebel Cyrus. The latter, although supported by exiled Milesians, besieged the city unsuccessfully. After the rebellion of Cyrus was suppressed Miletus remained under Persian control. The Peace of Antalcidas (386 BC) put a final end to the independence of Asian Greeks. As regards Miletus, the Persian intervention played a favourable role, when by order of Artaxerxes II and the satrap of Ionia Strouses the city won a piece of land in the plain of the Maeander River, which was also claimed by Myous. Miletus later came under the control of the Hecatomnides (377-353 BC), the semi-autonomous satraps of Caria. In 334 BC Miletus was one of the most powerful fortified places of the Persian defence against Alexander the Great. The Macedonian king had to besiege the city by land and water. Before the outbreak of operations, the oligarch ruler Glaucippus suggested that Miletus remain a neutral city, open to both the Persians and the Macedonians, but Alexander flatly refused. The city was finally captured. The defenders, Milesian and Greek mercenaries, suffered heavy losses. The inhabitants, on their knees, begged the king when the wall was pounded and torn down by Alexander’s formidable siege engines. Alexander felt very sorry for them and did not destroy the city but overthrew the pro-Persian oligarchy and restored democracy. Not before long (late 333 BC) the Persian fleet, which had remained almost intact during Alexander’s advance, recaptured the city. However, after the Persian fleet was permanently destroyed in the summer of 332 BC, Miletus was occupied again by the Macedonians under Balacrus.